For a Limited Time Only.....One Month Free on Select Units! THIS LAND IS ROOTED IN A PIONEER SPIRIT. It’s a place of new beginnings. A fertile ground of prosperity, providing sustenance and hidden treasure. For centuries the Wapiti roamed this thriving landscape while an aura of novitas beckoned, making West Jordan one of the fastest growing cities in Utah. Legend says that an Elk bounding into your life foretells a time of plenty. For nearly two centuries, new arrivals to West Jordan have been moved by the pride, power and passion of the Elk’s energy to make this place their home. To stand apart from the crowd and make their own tracks. To thrive. This novitas spirit lives on in luxury modern living at Jordan Valley Station. Smart homes with gourmet kitchens, expansive ceilings and lux touches from countertops to closets are ensconced in a community brimming with entertaining and recreational amenities. All just steps from the TRAX that will keep you connected to the metro workplace, area attractions and outdoor adventures. WE INVITE YOU TO WORK SMART. PLAY HARD. LIVE WELL. Legend says that an Elk bounding into your life foretells a time of plenty. 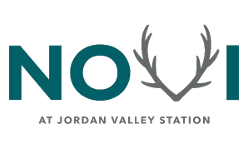 And that’s just what you’ll get when you live at Novi at Jordan Valley Station.